OnTimeRx® is an award-winning reminder app that thousands of patients use multiple times every day to successfully manage medications and other health-related activities. With unique reminder alarms and dosage logging features, this is the app that enables your customers take their medications properly. OnTimeRx® Free provides unlimited drug entries with ads. OnTimeRx® Pro is also unlimited with no ads. OnTimeRx® Lite is limited to 4 drug entries with ads. Provide these OnTimeRx® Free downloads on your website and deliver your own messages multiple times every day! App can be fully localized in other languages to serve your customer’s ethnic needs. App can be "white labeled" and pre-populated with specific medications and product information. Your customers will thank you for providing the perfect tool that enables them to be better patients. OnTimeRx® Reminder Products and Services offer simple and effective patient-focused tools that provide real solutions to compliance barriers for non-compliant patients. Healthcare providers can confidently recommend OnTimeRx® Reminder Products and Services to patients. This field-tested concept and value-added service has been proven to improve outcomes for a variety of practice settings and specialties. Patients who utilize this technology are better able to follow complex orders and become a better patient and a vital part of the healthcare team. Better informed and committed patients reduce the time required for doctors, nurses or pharmacists to explain new or changed drug therapy. Doctors and EMT personnel can review a patient’s personal medication lists and medical history records directly on the patient’s smartphone (with permission to access). Current compliance rates and dosing data can also be viewed on the patient’s Log. OnTimeRx® software and OnTimeRx® Reminder Services promote compliance and improve patient outcomes, which results in fewer costly hospitalizations. Patients who utilize reminders will achieve better compliance, which helps contain healthcare costs in general, and justifies coverage of this value-added service. Reminders can provide an improved standard of care for little additional cost. Patient-focused reminders can be utilized in a "team approach" to managed healthcare. Individualized care reminder plans enable special needs patients to stay on track. 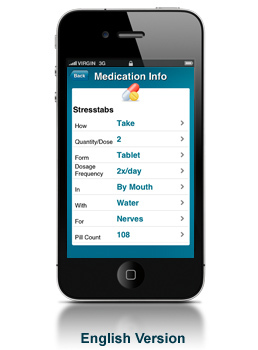 OnTimeRx® Automated Phone Reminders provide stress-free and consistent medication management. Reminders can be used by patients or by non-medical personnel for tracking medications and other activities of daily living. Providing and documenting the use of Reminder Services can facilitate reimbursement. Click here to submit Questions or request bulk pricing information for adherence research projects. Call us at: 201-558-7929‬ to discuss details. As a nurse, I've recommended this program to many people. On the personal side, it's been a godsend! I have multiple chronic illnesses myself. Consequently I take 27 rxs which are frequently changed, see 13 diffierent doctors, and am in the hospital every 10-14 days. This app helps tremendously. In fact, it's literally been a life-saver because if I miss even just 3-4 doses, it turns into a life-threatening situation. So I thank you for creating this app!